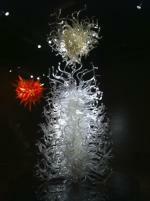 Chihuly Garden and Glass Museum has the most gorgeous and memorizing glass artworks that I have ever encountered! The museum has different exhibits and each exhibit has its own theme and style to broadcast their own colorful glass creations. Located at the base of the Space Needle in downtown Seattle, The museum has a great view of the Space Needle from the Glasshouse. It is beautiful to visit both during the day and night, giving it two different but phenomenal perspectives in the garden. During the day the garden shows off the glasswork details while at night the glasswork illuminates the garden! 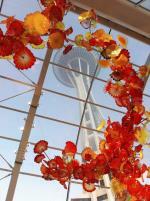 Getting to Chihuly Garden and Glass Museum is super fun. I went to the Tukwila International Boulevard station to take the link light rail to Westlake station. 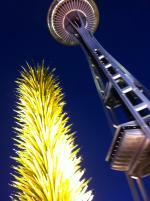 Once I arrived in downtown, I went to Westlake mall to take the Monorail to Chihuly. Riding on the Monorail was so cool because it went super fast and gives you a great view of Seattle and the Space Needle. The monorail train stopped right in front of Chihuly Garden and Glass and the Space Needle at Seattle Center. The exhibits were beautiful once I entered Chihuly! 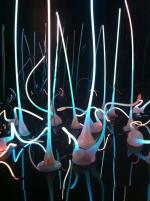 The first exhibit I entered was the Glass Forest, where all the art pieces were blue and pink in one dark room. It was very interesting to look at and I love how neon these art pieces were! For some reason, they kind of looked like “neon guitars” to me! The Northwest room was beautiful and was my second favorite exhibit due to it’s cultural theme. The quilted blankets were extremely gorgeous and so soft that I couldn’t stop touching them! I really liked the fact that there were artifacts in that room along with the glass art pieces. It really gave me a good understanding and vibe of the Native American Culture! The next exhibit was the Sealife room! There was a huge blue glass piece in the middle of the room and I kept on thinking “How did they build this?”! It was so big and detailed, and in a way it kind of reminded me of a blue Christmas tree! If you looked closely, you could see little glass sea creatures built in it! Also,If you look around the room, there were other little glass statues that had little sea creatures incorporated in it! So adorable! I really loved the next exhibit, which was the Persian Ceiling! I thought it was really unique how they had a ceiling full of art pieces! Even though the exhibit was smaller compared to the rest of the exhibits, to me it felt very romantic! I noticed that many couples went there to kiss, hug, and just have nice quiet time together. My fiancé and I started to play “I Spy”, using all the glass art pieces in the Persian Ceiling! Definitely a hard time looking for the “I Spy” item since there were a ton of art pieces and they were all very detailed, but it was super fun and silly! The Mille Fiori room made me feel like I was in a colorful glass jungle! There were different styled glass pieces all in one place, and I thought that was pretty amazing! All the art pieces looked like wild plants! There was a photographer walking around that worked for Chihuly who took pictures for free for people, so we asked him to take our first picture in Mille Fiori! Ikebana and Float Boat exhibit was my absolute favorite room! To me, all the rounded glass pieces looked like planets! I love astronomy and love hearing about different planets that scientist have discovered, so when I entered this exhibit I was super thrilled! My fiancé and I started to pick out which “planet” we would love to live on! Once again, we asked the photographer if he could take another picture for us in this room since I was such in awe of it! The Chandeliers and the Macchia were the last two indoor exhibits (besides the theater and Glass House). The glass chandeliers were hanging from the ceiling, which was amazinggg! In a way, the Chandelier room kind of reminded me of the Sealife Room because it had a glass artwork that looked like a Christmas tree as well! The Maccia Forest was very beautiful and I love how they made the art pieces to look like big huge bowls! To me, they kind of looked like an upside down colorful glass lamps! So gorgeous! The Glasshouse was definitely breathtaking! It is one of the biggest exhibits compared to the others, and as noted before, you could see the Space Needle and the outside garden from this exhibit. The Glass House was a good “relaxing spot” and the red and orange glass pieces from the ceiling were beautiful, especially when the sun light made it sparkle! The Glass House was also a perfect spot to see the sun set, which made it pretty romantic like the Persian Ceiling exhibit! It had the perfect view of the Glass Garden as well! Last, but definitely not the least, was the Garden exhibit! It was very beautiful! It was detailed during the day and at night the glass illuminated the garden! There were many glass “plants” and they looked beautiful during the day or at night! There was a glass “sun” that was so cool to look at and it was huge! 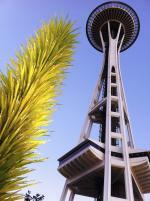 I wish I could have a garden like the Chihuly Garden! 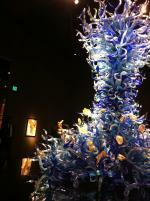 I definitely recommend this to be the last exhibit stop at Chihuly! The Space Needle and one of the Glass plants during the day and at night! 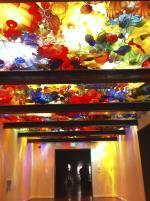 Overall, the Chihuly Garden and Glass Museum is one of the most gorgeous museums I have ever seen! 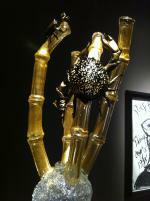 I highly recommend this museum to anyone who wants to see beautiful (glass) artwork in different shapes and forms. There’s also a gift shop, a Collections Café, and a theater to visit! I believe that the best time to go there is an hour or two before sunset and stay there an hour after sunset, since the garden gives you a different atmosphere during both times. Also, don’t forget to ask the photographers to take pictures for you!